Bison second year swimmer Kelsey Wog in action at the U SPORTS Swimming Nationals in Toronto. Photo by Martin Bazyl. 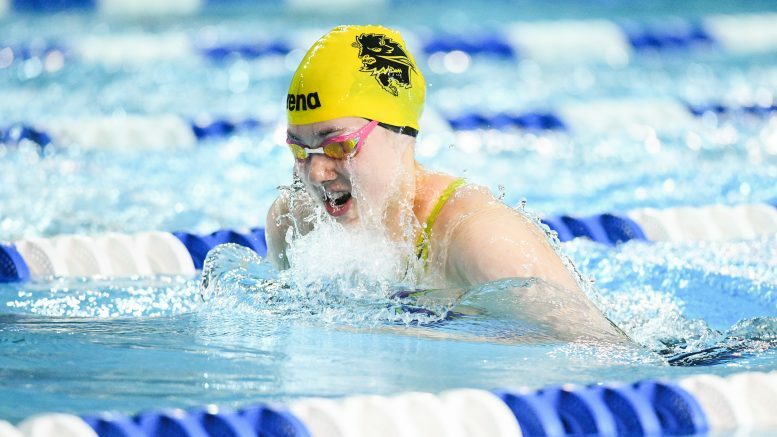 The remarkable career of Bison swimmer Kelsey Wog continued this weekend at the U SPORTS National Championships in Toronto. On day one of the competition Wog took gold in the 100m breaststroke for the second straight year with a time of 1:06.26, a whopping two seconds better than McMaster’s Olivvya Chow. The next day, Wog also took home gold in the 200m breaststroke with a time of 2:21.84. Wog wrapped up the weekend with gold in the 50m breaststroke, with a time of 31.57 and a silver in the 200 individual medley with a time of 2:10.38. Bison swimmer Anthony Iliouchetchev missed out on the podium in the 100m backstroke, finishing in sixth with a time of 54.48. The Bison women’s swimming team finished in 12th place out of the 25 schools competing with 216 points. The men finished 13th with 102 points. The University of British Columbia Thunderbirds swept the competition, winning both the men’s and women’s championships for the second year in a row. 2016 Olympians Kylie Masse of the University of Toronto and Yuri Kisil of UBC were named the male and female swimmers of the year, the second straight year for each to receive the distinction.